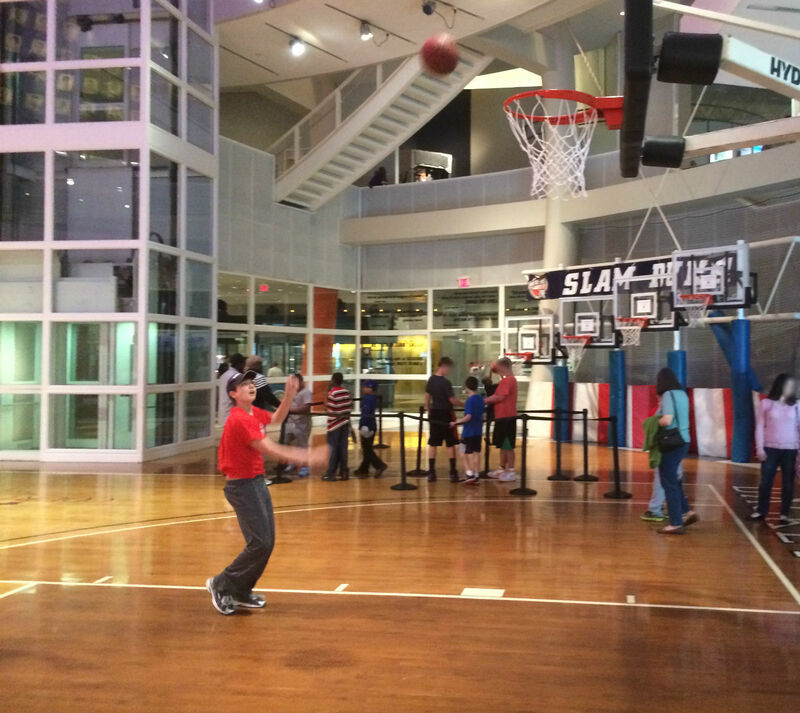 Ryan puts up a shot at the Basketball Hall of Fame in Springfield, Mass. In the years since I could add the following: Scranton/Wilkes-Barre, Pa., Washington, D.C., West Hartford, Conn., State College, Pa. and Springfield, Mass. Pretty much all the hotspots. And though Boston, Philadelphia and Washington qualify as popular tourist destinations, we didn’t walk the Liberty Trail or take a ride on a duck boat. We didn’t see the Liberty Bell or visit the Smithsonian. The purpose of all those trips was sports — either NHL or AHL hockey games, or Michigan football games. By my count, Ryan and I are up to eight overnight trips to sporting events, which doesn’t include several other family outings to Washington or some of our day trips to see the Jets and the Yankees, or venture into New York City to see the Sharks at Madison Square Garden. The first of those trips came in 2008 — six years and a lifetime ago. I was so worried about that adventure. I packed every conceivable comfort of home. We navigated some rough moments, but we got through it, catching a Capitals playoff game in Washington. A year and a half later, we set off on what is still our most ambitious trip to date, seeing the Sharks play in Detroit and watching a Michigan football game in Ann Arbor on Saturday. That trip, a gift from the scheduling Gods, also had to be carefully navigated. When we weren’t at the games, Ryan was playing with his Hockey Guys or checking stats on my laptop. He had all his routines interrupted, and yet he persevered through it all. Since then, it has become much easier. Not just easier, but EASY. Period. Full stop. Saturday, we went to Springfield for an AHL playoff game because Riley was hosting her annual slumber party and we had to get out of the house. I first thought of the idea on Thursday. I bought tickets and booked a hotel on Friday and we set out Saturday morning. There was no long lead-up spent preparing Ryan for what was to come, because it wasn’t necessary. These days, Ryan’s preferred activity when riding in the car is to listen to his iPod and barely speak. While quiet from the backseat isn’t always a bad thing, I didn’t want to spend three hours mumbling to myself on the drive up. I convinced him we could have a conversation. And we did, for almost two hours. We talked about hockey, of course, and had a detailed discussion about which stats are the most important. We laughed. We told jokes about certain players and teams. Once the day’s afternoon NHL playoff game started, Ryan watched on my iPad and described the action for me. We talked about the game for the last hour of the drive. Springfield is best known for being home to the Basketball Hall of Fame, which was right across the parking lot from our hotel. Ryan has never shown much interest in basketball, and other than following Michigan, it’s not that high on my list either. But basketball was the only one of the four major sports halls of fame I hadn’t been too. I asked Ryan if he’d like to go and to my surprise, he said yes. He even willingly turned off the hockey game before the third period to go. If you’ve never been, the basketball hall is awesome for kids. The centerpiece is a full-sized court with dozens of balls to use and baskets at which to shoot. Ryan asked if we could play, and then surprised me with his improvement. We were at the museum for roughly two hours, and spent more than half the time shooting hoops. We shot at the regulation rims. We shot at the model of Dr. James Naismith’s peach basket. Ryan tried his hand dunking on the eight-foot rims. We had a grand time. 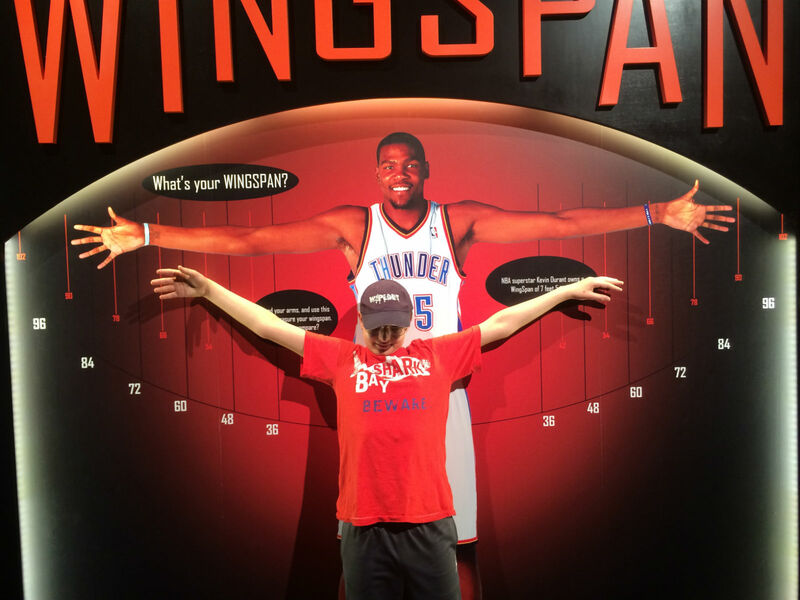 Ryan compares his wingspan to Kevin Durant at the Basketball Hall of Fame. Soon we were back to the hotel for just a bit of a break, then off to dinner and the hockey game. When that was over, it was back to the hotel and to bed without any issues. He even slept late! We had breakfast, then spent some time in the hotel pool before starting for home at around 11 a.m.
We were gone a little more than 24 hours, and in that time, there was not one issue. Ryan was agreeable to everything. Granted, I wasn’t exactly stretching him out of his comfort zone, but it could not have been easier. There was no complaining, no irritation but altered routines. No worries about stats. No protesting doing something that wasn’t hockey-related. When we got home and Veronica asked me how it had gone, the one word that kept coming back was “easy.” When I think back to that first solo trip to Washington six years ago, I could have come up with a lot of adjectives to describe it. “Easy” would not have been one of them. 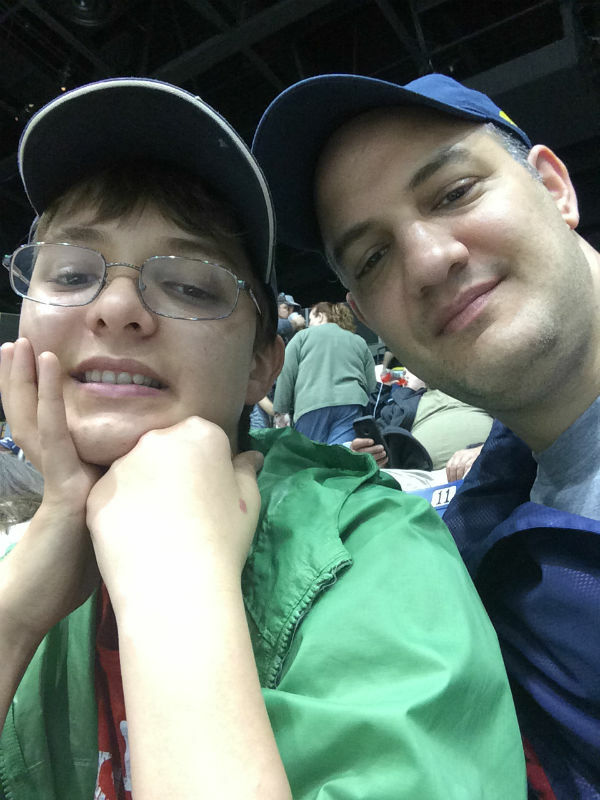 With Ryan at the Springfield Falcons game. It was easy. I took many sports road trips with my dad as a kid. We traveled all over the country to see all the old baseball stadiums — Fenway, Wrigley, Comiskey. We packed in other site-seeing along the way. I remember telling some friends about my summer vacation trip to “Pittsburgh, Cleveland and Detroit,” and receiving quizzical stares in response. But I wouldn’t trade those trips for any Caribbean cruise. It was just me and my dad, engaged in a mutually enjoyable activity, creating memories to last a lifetime. I can only hope that Ryan views our adventures the same way. Fantastic! Congratulations to both you and Ryan. We will be trying our ambitious trip next year, to London. Like you, we are already planning, preparing, etc. it is the way of the Autism parent, I think. Awesome! Good luck on your big adventure. We are gearing up for a big one next year too — all the way to San Jose. Those trips are good for him. When I was a kid (and before anyone knew I had Aspergers) my mom signed me up with the local scout group. And the scouts was really good for me. I enjoyed the nature, the leaders were really good (without knowing anything about autism they just tried different approaches to my difficulties). I have went on many trips since then, mostly with trains, and mostly with at least one person I know, or by myself. Good luck! Sounds like a fabulous adventure. I thinkt it willl. We will combine regular hiking with going by steam trains, exploring old railway and stuff. Thank you for sharing. Please feel free to come back and let us know how it went. You know this started at the YMCA/Springfield College. The YMCA lays claim to several sports as such as Basketball, swimming lessons, et..